DO YOU CARRY COMMERCIAL BUSINESS INSURANCE WITH A MILLION DOLLAR LIABILITY COVERAGE? ​ Occasionally your venue will require that your vendor provide their proof of insurance. Newer photo booth companies may not have, or be able to obtain, this type of business insurance. We carry 2 million dollar insurance policy to cover any event. WHAT TIME DO YOU ARRIVE TO SET UP? AND HOW LONG TO BREAKDOWN? We arrive a 1 hour - 1.5 hours in advance to set up. If you wish for us to arrive early we will consider that idle time and charge a extra fee. We breakdown our gear and leave the location in 30 minutes. WILL THE PHOTO BOOTH PRINT ON THE SPOT? Yes! The prints are ready in 15 seconds. We carry professional DNP printers to ensure your photos come out perfect. WILL THERE BE A ATTENDANT AT THE EVENT THE WHOLE TIME? Yes. There will be a photo booth tech by the booth at all times to ensure everyone is having a great time. DO YOU WORK CHARITY EVENTS OR SPONSOR EVENTS? We do offer special discounts to charities depending on our schedule and type of event. WHAT KIND OF BACKDROP DO YOU HAVE? We do offer free backdrops from our selection, of course we can purchase any backdrop you request at an additional cost. CAN WE PURCHASE OUR OWN BACKDROP/PROPS/SCRAPBOOK? WHERE'S THE BEST PLACE TO PUT THE BOOTH? The best place to be set up is inside, of course sometimes inside can be too crowded. If placed out it's important we are set up near a wall or in a wind free zone as our backdrop acts like a sail and will blow away. 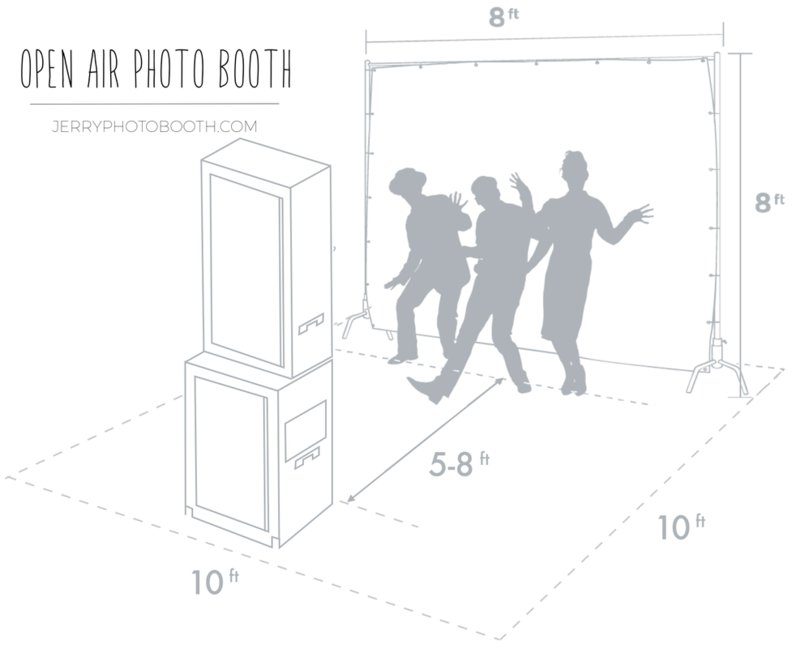 WHAT'S THE SIZE OF THE PHOTO BOOTH? ​SUBMIT A BOOKING FORM TO REQUEST A DATE FOR YOUR EVENT. IF YOU WANT TO ACQUIRE SOME INFORMATION ABOUT OUR SERVICES FILL OUT THE FORM AND ASK US ANY QUESTION IN THE COMMENT SECTION. THANK YOU AND HAVE A AWESOME DAY.